This growing season, New Entry Sustainable Farming Project is holding a brand new class that teaches students everything they need to know about producing crops. New Entry staff noticed that more and more applicants to the incubator farm site in Dracut, MA were in need of a better understanding of all that farming involves, beginning at the very basics. The New Entry Farmer Training Team saw the need to develop a new course for those who didn’t have much farming experience but were eager to learn. The class meets on Tuesday evenings from 6-9pm for 10 sessions throughout the growing season to cover topics such as seed selection, greenhouse management, botany, irrigation, nutrient management, weed management, pest management, and post-harvest techniques. The development of this course was funded through an NRCS Conservation-Innovation Grant, a grant that drives innovation in resource conservation. This grant has helped New Entry Sustainable Farming Project further our mission to teach new farmers sustainable techniques from the very beginning of their career. Our first class has 30 students enrolled, all of them excited to learn how to produce vegetable crops. 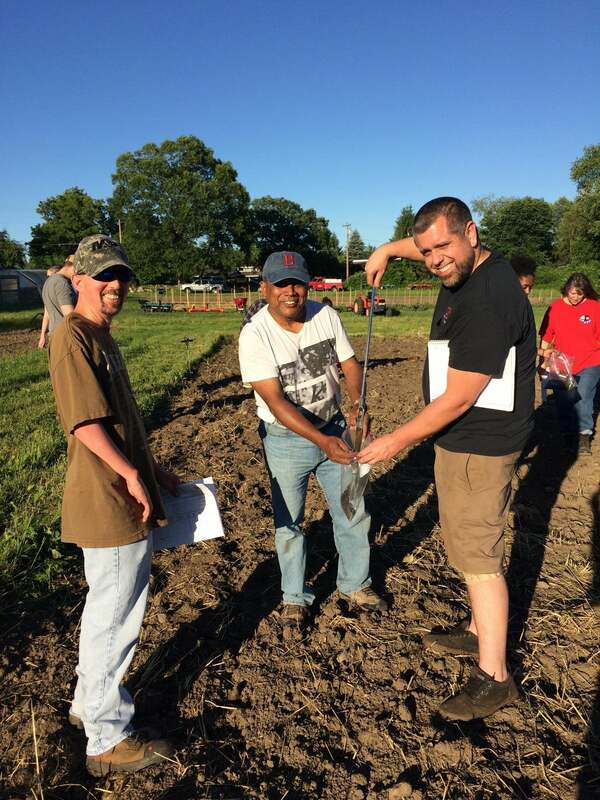 The course started in April with indoor sessions for topics such as crop planning and introduction to sustainable agriculture and in May the class moved outdoors to New Entry’s incubator farm in Dracut for hands-on activities and field demonstrations. The first thing we discussed in the crop production course was what the word “sustainability” means in agriculture. We wrote the word “sustainable” on one side of a white board and “unsustainable” on the other side and asked the students to list things under each word that related to agriculture. Oftentimes the same thing would be on both sides of the list, such as organic, tradition, and GMO technology. Preservation of environmental resources was a recurring theme under the “sustainable” category. At the end of the night one student said, “the most significant thing I learned in today’s class was there isn’t one definition for sustainability and not all methods work for everyone”. Another student said, “I learned how many ways there are to be sustainable and how many different perspectives there are!” In their first steps towards thinking like a farmer, students learned how complex farming is, and that there is a vast amount of knowledge needed for today’s farm. The class will meet again on July 10th for the 7th class, where we will discuss weed management strategies. So far, we are all enjoying getting to know each other, learning from each other, and playing in the dirt. For more information about this class or future classes, contact Juliette Enfield at Juliette.enfield@tufts.edu.